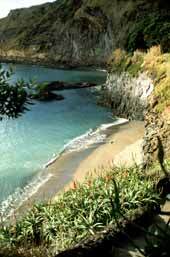 With about 760 sqkm (65 km long and 16 km wide) São Miguel is the largest island in the Azores. Although over half of the population of the Azores (about 126000) live on this island , there are still large areas of great natural beauty. São Miguel´s two high volcanic areas to west and east are separated by a lower central area, which is the agricultural heartland of the island. It is from the green fields in this area that São Miguel derived its local name, ILHA VERDE, Green Island. The volcanic nature has contributed to creating an island of outstanding beauty. In Furnas, there are boiling geysers where complete meals are sealed into pots and buried in the hot earth for several hours to produce the local delicacy known as "cozido". Vast craters containing beautiful lakes, a hot waterfall in the woods, hot and cold mineral springs and idyllic beaches are some of the fascinating natural wonder of this island.